Photograph courtesy A Wynn - collection of Roger Geach 25201 & 25037 at Pwhelli on August 24th 1986 with F&W's Snowdonian II railtour. The twenty two year career of D7551/25201 was entirely spent allocated to London Midland Region depots. Time between last Classified repair and withdrawal: 80 months. Time between withdrawal and scrapping: 11 months. October 1965 to Leicester Division (D15). August 1967 to Nottingham Division (D16). October 1967 to Carlisle Kingmoor (12A). January 1968 to Springs Branch (8F). May 1968 to Allerton (8J). June 1968 the Liverpool Division (D08). September 1968 to Preston Division (D10). May 1973 to Carlisle Kingmoor. Carried the name Castell - Y - Bere (at least by February 1st 1987). 25201 was the 304th Class 25 to be withdrawn, one of four Class 25s retired during January 1987, leaving 23 Class 25s remaining in service. After withdrawal 25201 was stored at Basford Hall until moved to Leicester on July 29th 1987 with 25173 & 25288, and moved into Vic Berry's Yard the next day. 25201 was broken up by the third week of January 1988. 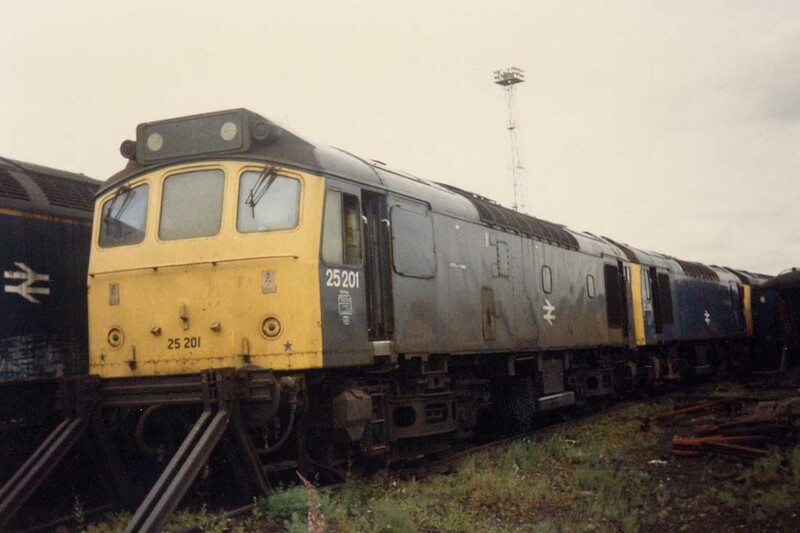 Photograph courtesy Mark Jones The end of the line for 25201 & 25288 at Basford Hall, Crewe on July 11th 1987. The locomotive has acquired a number on the cabfront and the small white painted name Castell - Y -Bere is just visible on the side. Noted Derby Works March 1974 (dual braking equipment fitted). Noted Derby Works May - September 1976. Noted Derby Works September 1978 - January 1979. Noted Derby Works March - May 1980 (general repair). On June 10th the 09.00 Manchester Victoria - Glasgow Central was worked to Carlisle by 7551 & 1620. On August 1st the 23.45 Newcastle - Stranraer Harbour was worked throughout by 7551 & 5283, the locomotives returning with August 2nd's 13.50 Stranraer Harbour - Newcastle. The night of December 3rd produced heavy rain and high winds leading to a tarpaulin cover on the 22.23 Gushetfaulds - Dudley freightliner working loose and damaging the overhead equipment between Carstairs & Lamington. The damaged overhead line equipment affected the following train, a Gushetfaulds - Garston freightliner causing one of its locomotives to lose a pantograph. The train behind this, a Glasgow - Euston passenger became trapped and would reach Carlisle over four hours late. Other trains were diverted away from the WCML, with the consequent serious late running. By the next morning Class 47s were on duty at Carstairs to assist electric services through the section. However the troubles were not over, in the early afternoon of December 4th a Kingmoor - Ravenscraig freight with 25201 was stopped at Symington with part of its load fouling the up line, it would take two hours to secure the load and clear the line. 25201 came to a stand at Symington with part of its load of strip coil bound for Ravenscraig fouling the up line, a delay of two hours ensued whilst the loads were secured. The 20.45 Barrow - Euston was worked to Preston by 25201 on August 19th. April 1st found 25201 with five coaches working the 'Hundred of Wirral' railtour out of Liverpool Lime Street to various locations on the Wirral peninsula. Reversals were necessary at West Kirby & New Brighton, with 25294 being added to the rear between Birkenhead North & Heswall. On May 29th 25201 worked the 16.02 Crewe - Cardiff and on May 30th worked the 17.10 Cardiff - Crewe. 25201 & 76016 at Reddish depot on an overcast February 24th 1980. At this time 25201 was allocated to Carlisle Kingmoor. On November 12th spruced up 25201 & 25200 worked an empty four coach Royal Train from Aberystwyth to Wolverton(? ), the Royal Train having run over night taking Prince Charles to a royal engagement in Aberystwyth. On September 6th 25201 & 25234 took over the 08.20 Northampton - Aberystwyth day excursion at Nuneaton but got no further than Birmingham New Street where they were failed and replaced. 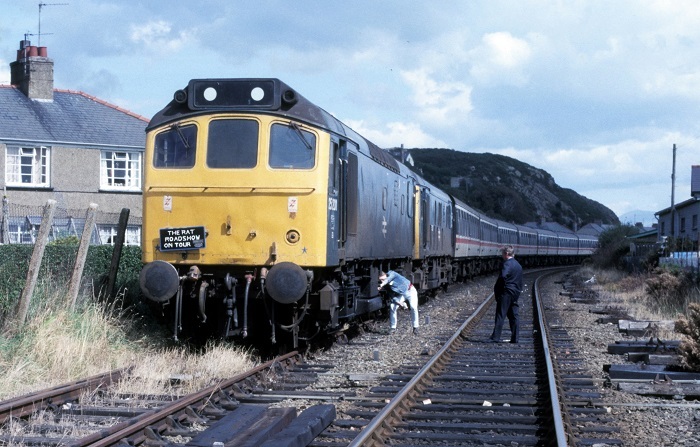 New freight contracts out of Heysham brought a considerable influx of Class 25s to the area, working the South Leith – Heysham coated gas pipes and return empties. During October 25201 & 25207 were regular performers on this working. On November 6th 25200 & 25201 worked the Leith South - Heysham Harbour pipe train. The 10.00 Crewe - Cardiff was worked by 25201 on June 4th. 25201 was noted dragging a failed two-car diesel multiple unit through Manchester Victoria station en-route to Newton Heath depot on July 26th. 25201 was stabled at Buxton depot on August 8th. On September 9th the Bickershaw Colliery to Carrington power station merry-go-round was worked by 25201, an unusual choice for this turn. A run round was required in the loop at Stoney Bridge near Skelton Junction, to allow access to the branch to Partington Junction. 25201 & 25202 (both equipped with three piece miniature snowploughs) ran light through Crewe station on February 26th. 25201 was noted stabled at Rugby station on July 17th in company with three other Class 25s. Engineering work on August 7th between Rugby & Bletchley saw 25201 & 25079 assist three electric services over the affected section where the power was off. It was off to the seaside on August 11th when 25201 worked the 09.37 Derby - Skegness relief and the 18.10 return. Towards the end of the month on August 29th a Nelson - Largs mystery excursion was worked Nelson - Preston and return by 25201 & 25178. On September 7th 25201 worked two passenger trains, the 18.23 Barrow - Liverpool to Preston, where it was terminated, then the 21.00 Preston - Crewe relief. 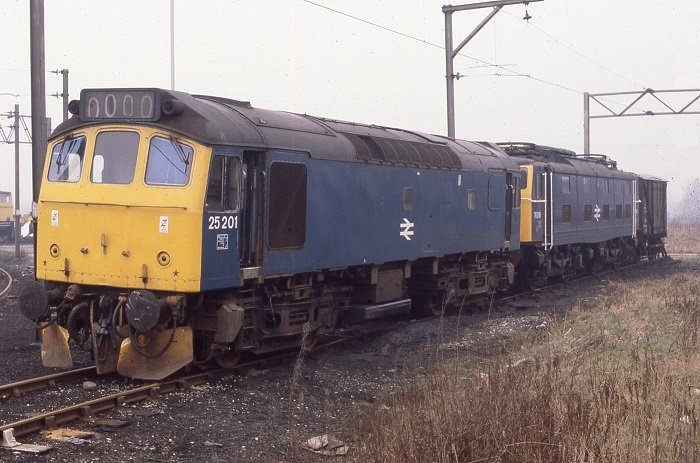 On October 26th 1983 25201 worked the 20.15 Tees – Bescot Speedlink. 25201 was stabled at Carnforth station on January 15th. 25201 was stabled at Severn Tunnel Junction on February 25th. When 31424 failed at Leicester on May 15th working the 07.40 Norwich - Birmingham New Street, 25201 took over and later continued with the 12.30 Birmingham New Street - Peterborough and 17.20 return. On May 22nd 25072, 25201 & 25211 had been noted in the Rugby area working permanent way trains, in the evening they ran light to Bescot. 31289 & 25201 were noted at Radlett with a southbound engineers train on June 24th. 25201 came to the rescue again on July 6th when 31423 failed at Nuneaton working the 16.45 Norwich - Birmingham New Street, 25201 completed the working. Two days later (8th) 25201 worked the 17.20 Birmingham New Street - Norwich as far as Leicester, where 31210 took over. The Ditton BOC - Broughton Lane tanks continued the use of a Class 25 & 40 pairing, being worked on August 22nd by 25201 & 40028. Four days (26th) later 25201 & 25239 assisted an ailing 85025 throughout on the 02.35 Euston - Bletchley. On August 29th 25201 & 25218 were noted southbound through Warrington with oil tankers. 25201 was noted northbound at Carlisle on the wet evening of September 22nd with loaded cartics. An oil tank train from Stanlow was noted passing through Chester with 25191 & 25201 on the night of October 1st. 25201 was on hand to cover another failure, this time the diesel multiple unit on November 15th's 17.44 Nottingham - Sleaford and 20.40 Sleaford - Lincoln Central. For 25201 Christmas 1984 was spent stabled at Springs Branch. On April 23rd the evening Bristol – Newcastle parcels was noted at Chesterfield with 25201 & 25245. On May 1st 25201 was in charge of the 15.02 Manchester – Bristol parcels. On May 5th 25201 & 25245 started a couple of days of passenger workings, with the 18.28 Liverpool - Barrow followed by the next day's 16.40 Nottingham - Barrow and finally the 21.50 Barrow - Crewe to Preston. 25201 was noted arriving at Crewe station with parcels coaches and later shunting two guards vans there on May 25th during the station remodelling. On the afternoon of May 29th 25173 & 25201 were noted on the ECML at Thirsk with a train of coal empties. During August 25201 was connected to a couple of Class 33 workings. The failure of 33050 at Shrewsbury on August 24th's 05.33 Cardiff - Crewe saw 25201 take the train forward to Crewe. On August 27th 25201 was noted at Nuneaton with bogie ballast wagons. And on August 28th the 07.19 Manchester Piccadilly - Cardiff was worked forward from Crewe by 25201 & 33004. 25201 was noted at Stafford on September 5th. 25201 & 25191 worked the afternoon Dalston - Grangemouth oil tanks on September 6th. On September 12th 47520 failed at Chester working the 17.03 Holyhead - York, 25201 took the service to Manchester Victoria. On September 17th the 07.45 Glasgow Central - Birmingham New Street with 87034 was dragged between Crewe & Stafford by 25201 & 25173. When 56105 failed on an afternoon York – Tees coal empties on November 28th, 25175 & 25201 were provided for the remainder of the trip. They later returned south on an evening salt working to Reading. Perhaps the most interesting passenger working for 1985 for 25201 was on December 14th when it worked the 11.14 Bangor - Newcastle as far as York. Three days later (17th) 25908 & 25201 were noted on a Margam – Crewe coal empties. The next day (19th) 25201 & 2523 were noted southbound passing Normanton with short wheelbase oil tankers. On January 30th the Severn Tunnel Junction - Exeter cartic working arrived behind 25201. 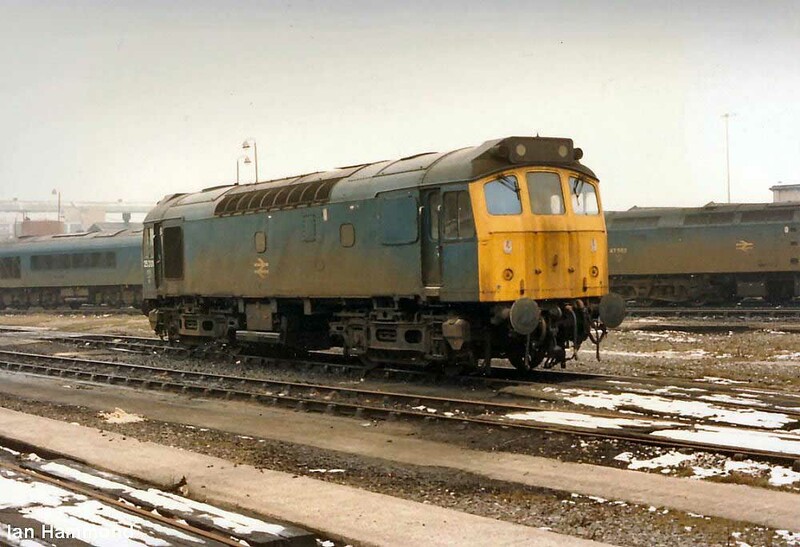 Photograph courtesy Ian Hammond 25201 stands at Saltley on a chilly February 15th 1986. The 3B05 SO 07.45 Holyhead (or Bangor?) to Bletchley Yard empty NPCCS vans on March 1st was noted passing Holywell Junction & Atherstone with 25201. 25201 was stabled at Derby London Road curve on March 8th. 25201 was noted light engine at Manchester Victoria on May 18th. On May 23rd 25201 was the Manchester Victoria station pilot/banker. On May 27th 31454 failed at Manchester Victoria with the 05.23 Hull - Liverpool, 25201 dragged everything to Liverpool. The 18.20 Glasgow Central - Manchester Victoria was taken forward from Preston by 25201 on August 12th. On August 24th F & W ran their 100th tour, a re-run of their first trip in 1973. The ‘Snowdonian II’ (1Z37) starting at Paddington used 25201 & 25037 for the 296 mile round trip Wolverhampton to Pwllheli. An oil leak troubled 25201 but on board surgery kept the machine running. The next day (25th) the same locomotives worked a roundtrip Manchester Victoria - Liverpool football special. 25201 was noted eastbound at Manchester Victoria with a parcels train on October 11th. 25201 was receiving attention at Crewe depot on October 19th. On October 31st 25201 was noted running through Huddersfield with a rake of coaches, later that day it was noted in charge of the 15.02 Manchester – Bristol parcels. The last four recorded passenger workings for 25201 were all the result of failures and were scattered across the country. On November 3rd 47468 failed at Chester with the 13.00 Bangor - York, 25201 took the train forward to Manchester Victoria. About a month later on December 5th 31408 expired at Leicester on the 10.30 Birmingham New Street - Norwich, 25201 took the train forward to March, being replaced by 37209. It was noted stabled at March depot the next day. On December 30th a Cardiff - Manchester Piccadilly service failed on departure behind 47564, 25201 is reported to have worked the train to Crewe. The final recorded passenger working for 25201 took place on January 5th assisting a diesel multiple unit on the 16.45 Kidderminster - Birmingham New Street forward from Stourbridge Junction. 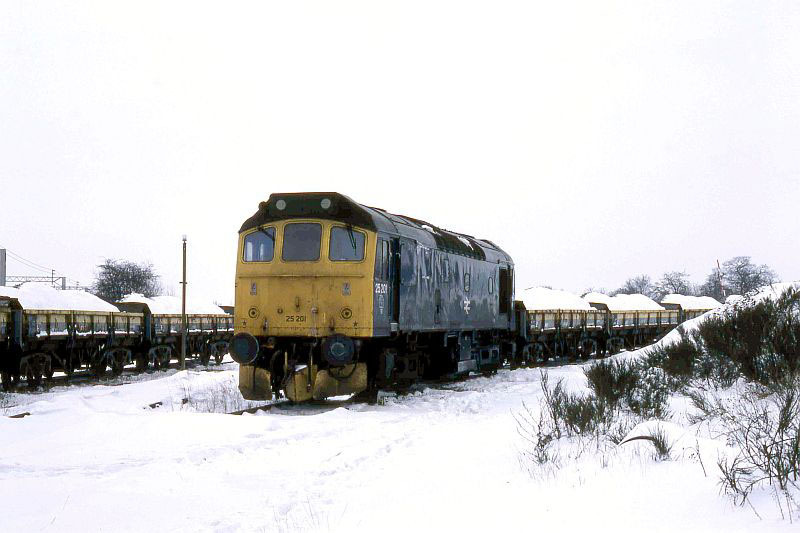 Photograph courtesy Ron Kosys Its January 16th 1987 and 25201 has been diagrammed for the Hartshill turn. Unfortunately the weather has taken a turn for the worse and a heavy snowfall has created a different panorama for the yard. Even worse the weather has caused the ground frame to freeze up trapping the locomotive and its train in the yard. It will finally be towed out of the yard a couple of days later. 25201 had earlier worked the Guide Bridge - Hartshill working on January 13th. The TOPS report showed it as out of service at Nuneaton on January 17th with loss of power, could its entrapment at Hartshill have something to do with this? Time was running out for 25201, it was noted at Toton on the morning of January 23rd (for repairs? ), by the early morning of January 25th it was at Bedford and moved on to Bletchley by the evening of January 26th but again reporting loss of power. Its next move was to Crewe arriving in the early hours of January 29th where it was promptly withdrawn. Black Cab Front Numbers: added sometime after December 1986. Three piece miniature snowploughs: fitted both cabs at least February 1980 to at least May 1985 & assumed to be continuous.